On previous visits to Aleppo, I met with the Aleppo Medical Association and saw a maternity hospital hit twice by rocket and mortar attacks by militants under Jaysh al-Fatah (the Army of Conquest), a loose alliance of anti-government terrorist groups. I met with members of a branch of the Syria Civil Defense and Christian and Muslim religious leaders. Just north of the city, I visited Nubl and Zahraa, towns besieged for more than three years by the Free Syrian Army, the Nusra Front, and other affiliated terrorist factions before the Syrian Arab Army drove them out in February of this year. I saw the liberated region of Bani Zaid and the al-Layramoun industrial district. I interacted with civilians in public parks, streets, and markets. Ahead of my trip earlier this month, I was interested to see what might have changed following the liberation of still more areas by the SAA. I also hoped to speak with civilians who had fled the terrorist-held areas of Aleppo’s eastern districts since I had last visited, during which time eight humanitarian corridors had been established for civilians and members of terrorist factions willing to relinquish their arms or to accept safe passage to areas in Idlib and government-secured parts of western Aleppo. However, on Nov. 4, no one fled terrorist-held areas of Aleppo. Family members of civilians still there say their loved ones are being used as human shields by groups like the Nusra Front, Ahrar al-Sham, or Nour al-Din al-Zenki — the so-called “moderate rebels” and “opposition forces” backed by the United States, NATO, Israel and Gulf allies like Saudi Arabia and Qatar. We walked through the ornately-carved entrance of a building in the al-Layramoun industrial district that once housed a dye factory. 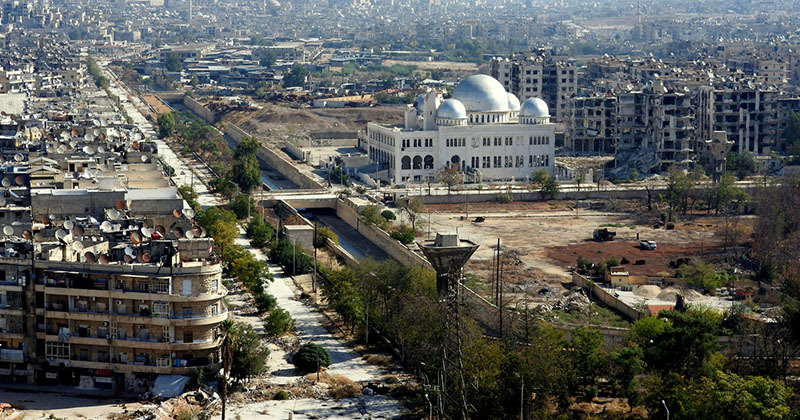 More recently, though, it’s been used as a base by the 16th Division of the Free Syrian Army. In an interior room, I noticed a 4G mobile phone card from Turkcell, Turkey’s leading mobile phone operator. In neighboring buildings we saw bags of materials reportedly used to make the gas canister and water heater explosives known colloquially as Hell 1 and Hell 2, the latter of which can inflict significantly more damage, including leveling entire floors of houses. There were also metal fragments, which are added to explosives to inflict maximum damage. Another room contained a pile of shavings which one of the Syrian soldiers accompanying us said was used to compress explosives in the gas canister bombs which the Free Syrian Army and other terrorist groups fire upon neighborhoods in greater Aleppo. When we approached the Nusra Front-occupied road leading toward Daher Abed Rabbo, SAA soldiers advised us to run, not walk. Just beyond that road, bunkered three stories below ground, the Free Syrian Army’s nightmarish improvised prison for SAA captives was untouched by the bombs inflicting damage above-ground. These attacks target terrorists who fire on the civilians of Aleppo and retreat underground. Al-Layramoun and Bani Zaid are home to the same landscape of battered buildings that one finds in areas where militants have bunkered deeply down. Seeing the destruction, some of the other journalists in our delegation mention only the physical damage to the buildings. “Buildings lay pancaked by airstrikes,” one wrote, pointing an incriminating finger at the Syrian government without giving any context as to why these areas were hammered. The real shame is not actually the physical destruction of buildings, but the incursion into these districts by Western-backed terrorists, including the Free Syrian Army, the Nusra Front, and Da’esh, among others. Nearly six years into the needless bloodshed, their criminal and savage acts against Syrian civilians and soldiers are well-documented. And it’s common knowledge that they bunker down to avoid airstrikes. The Free Syrian Army’s nine suffocating, improvised metal solitary confinement cells and three rooms used as regular cells in the underground prison bunker in al-Layramoun were all intact despite the aerial bombings. Buildings are devastated above-ground because of the presence of militants deep underground, where airstrikes inflict considerably less damage. On the afternoon of Nov. 3, after meeting with Dr. Mohammed Batikh, director of Al-Razi Hospital, the victims of terror attacks which had begun a few hours prior began to arrive one after another, maimed and critically injured. The vehicle bombings and bombardment of Grad missiles, among other attacks, left 18 people dead and more than 200 injured, according to Dr. Zaher Hajo, the head of forensic medicine at Al-Razi Hospital. In another corridor, a 15-year-old boy with a cast on one leg and bandages on his head, said the mortar attack which injured him had killed his 4-year-old cousin and left his 6-year-old cousin with critical injuries. In a front room, a mother wailed for her son who had suffered severe injuries. She screamed and pleaded for someone to save him, her only son. Not long after, though, the news came in: the 26-year-old had died. Her son, a doctor, was not the first medical professional to die in terrorists’ routine bombings of Aleppo neighborhoods. Dr. Nabil Antaki, a gastroenterologist from Aleppo, with whom I met on my trips to Aleppo in July and August, messaged me in October about his friend and colleague, Dr. Omar, who was injured on Oct. 6 when terrorist factions unleashed an attack on Jamiliye Street, killing 10 people. Just a few days after the attack, Dr. Omar, too, died.